Sometimes I just want a little dessert. And my favorite desserts are not chocolate-based or even fruit-based, but cinnamon-based. 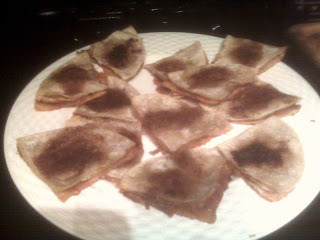 To quell this craving, the other night I whipped up a play on the classic cinnamon toast, with a little Mexican twist. And let me tell you one word to sum up this little recipe: heavenly. The first thing I made was a cinnamon toast-like mixture. Three parts white sugar (could use Splenda) to one part cinnamon to one part brown sugar, with a sprinkle of kosher salt. Then I put in little bits of light Smart Balance (could have used butter), maybe a teaspoon at a time and mixed the spices into it with a fork. I continued adding bits until it had nicely “taken in” all of the cinnamon-sugar. I next took six, small corn tortillas from the fridge and cut them each in half. My original craving was actually for a churro, so the corn tortillas came to mind as a way to make it a little crispier and churro-ier than cinnamon toast. I spooned a very small amount of the smart balance-sugar-cinnamon mixture onto half of each piece of tortilla and then folded the other half onto it so the stickiness of the mixture sealed it. I arranged all of the now quarter-tortilla-sized “churro quesadillas” onto a baking sheet and brushed them all with a tiny bit of olive oil and a sprinkle of sugar, cinnamon and salt. I placed them in a 350 degree oven for 11 minutes. When I removed them from the oven, the house filled with the gorgeous waft of cinnamon and sugar. My creations looked delectable. They were a little caramelized on the bottom, crispy on the top and soft and gooey and delicious in the middle. It really was like a cinnamon toast quesadilla. I gave a few to a wowed Julia and gave a few to a ravenous Me. I would describe how incredible the taste was in deep detail, but I think I already told you everything you need to know. Heavenly.